Gain a clearer picture of today’s ever-changing events sorted through the lens of five distinct worldviews: indigenous, modern, fundamentalist, globalized, and transformative. What worldview do you most closely identify with? Do you sometimes wonder if human beings will ever learn to get along? 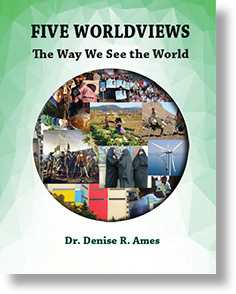 Worldviews are one of the lenses that help shape our perception of reality. 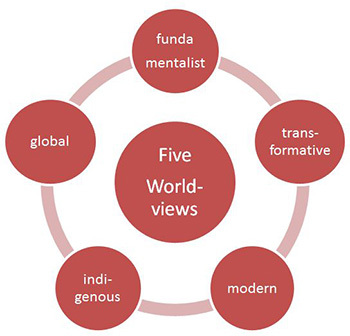 Recognizing these five worldviews—indigenous, modern, fundamentalist, globalized, and transformative—helps us develop awareness of other people’s perspectives without necessarily trying to change them. We cannot have a vibrant democracy if each of us stays in a bubble with people who share the same values and beliefs. We need to gain skills to navigate a more diverse world, which includes understanding those who live in a different zip code. With greater awareness we may stop expecting others to change their worldviews to fit ours and find that it is possible to discuss our differences with curiosity and respect. As we learn about these five worldviews, we can improve communication and relations with people who are similar to and different from us through uncovering shared values and bridging the cultural and social divide. All content © 2018, The Center for Global Awareness is a 501(c)(3) non-profit organization.